If recent reports are to be believed, Nintendo’s new console, the Nintendo NX, is to be revealed in the coming weeks. Time will tell if these rumors are legit, but a creative Reddit user has taken to time to compile a calendar with possible reveal dates in the coming weeks. Insiders and analysts claim that Nintendo confirmed the reveal in a private GameStop event. The NX is currently slated for a release in March 2017, and an October reveal would mean that the Nintendo NX will have the least time between reveal and launch of any Nintendo platform. 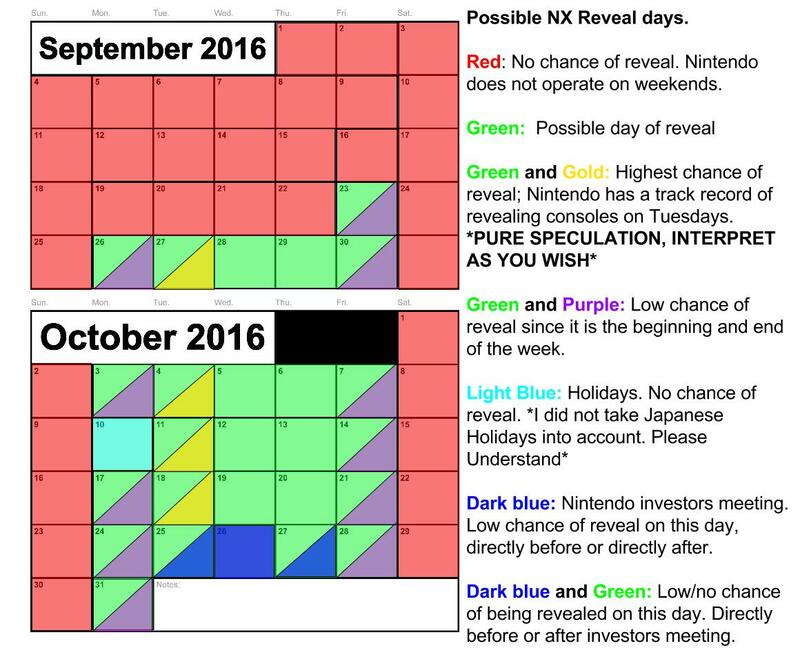 Reddit user Shaan1887 has made a Nintendo NX reveal calendar for the coming weeks based on Nintendo’s previous reveal dates, holidays, and Nintendo investor meetings. The calendar can be checked out below. Judging from the calendar, the highest change of reveal will be on either October 4, 11, or 18. This is based Nintendo’s track record of revealing consoles on Tuesdays. Of course, this is pure speculation at this point. In its latest annual financial repport, Nintendo reconfirmed that they are still planning to release the NX in March next year. With respect to hardware, Nintendo continuously investigates and undertakes research on fundamental technologies spanning data storage technology such as semiconductor memories, display technology such as liquid crystal displays, and electronic components, while it also carries out research and development activities to examine the applicability of various technologies including interfaces such as touch panels and sensors, wireless communication, networks and security to the field of home entertainment. Nintendo is also devoted to the development of a gaming platform codenamed “NX” with a brand-new concept, which will be launched in March 2017 globally. When do you think that Nintendo will reveal their new dedicated home platform? Do you think the NX will be delayed? Hit the comments below.